Today: Mandy from Lady and Pups replicates a Taiwanese street snack at home: crispy scallion pancakes, with plenty of layers. 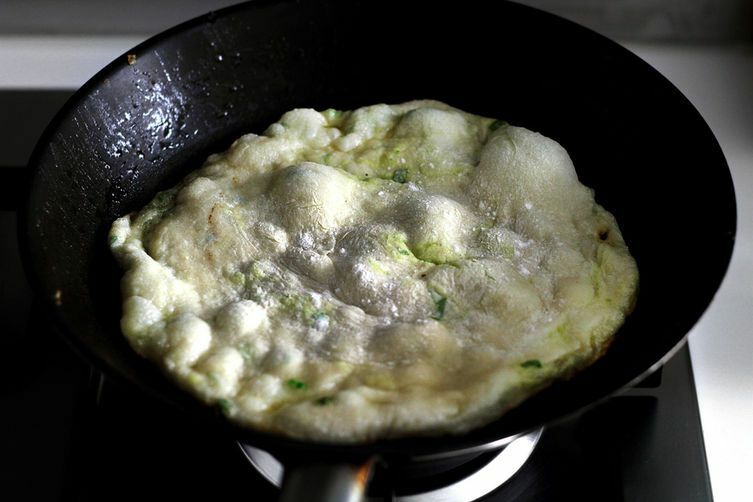 I can't tell you how many times I've tried and failed to make scallion pancakes over the past few years. They're one of my favorite street snacks in Taiwan: a thinly rolled out soft dough with layers of finely diced scallions, pan-fried to golden brown yumminess. It was a challenge to make a home-friendly version that tasted just as good -- not to mention the fact that the idea of replicating all of those layers was extremely daunting. Did I mention the street-version is almost always fried in lard? Luckily (or perhaps dangerously) for you, I think I did it. After years of harassing street vendors and a number of my mother's friends who allegedly make them, a love child was born. 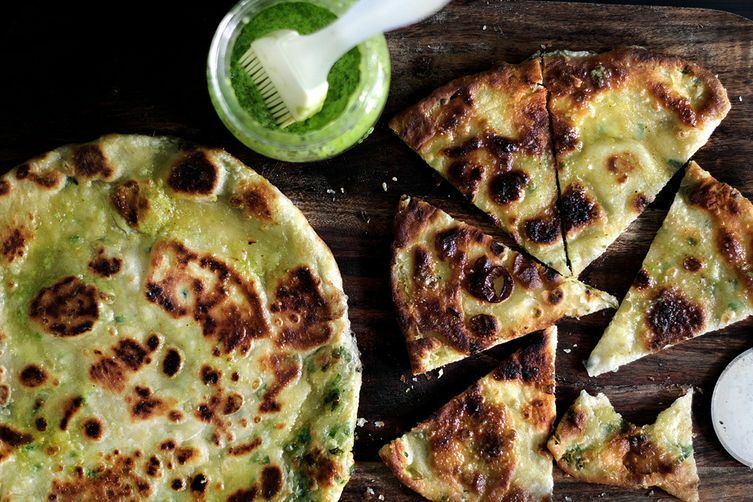 This scallion flatbread has a dough that's made with both all-purpose and bread flours, plus both hot water and cold water (a Chinese technique that creates both softness and body). Scallion oil with a pinch of baking soda puffs up the layers during cooking and boosts the overall flavor. These can even make a hearty meal if you toss a golden brown flatbread on top of an egg that's still frying in the pan, and let them "stick" together, then brush some chili sauce over the top. 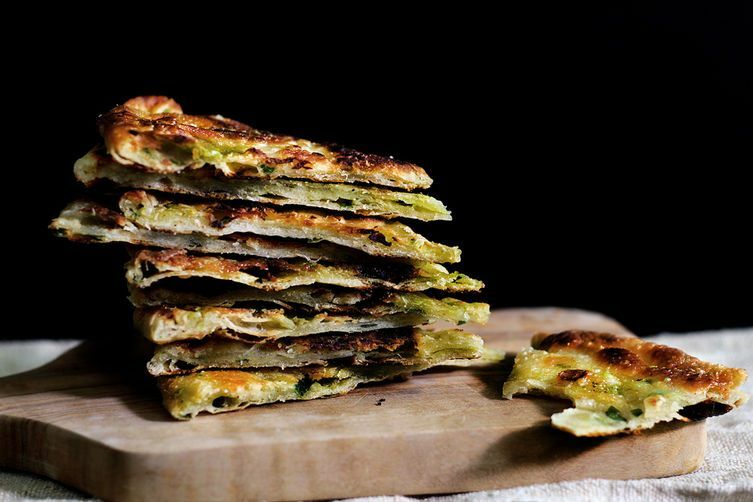 I was just telling a friend about how much I love scallion pancakes and how I wished I had a recipe for them. How fortuitous! Thank you endlessly. Yum! But my 15 year old son just asked What about he sauce?? Suggestions? Gail, a solid handful of scallions should do it. Bread flour will give it more "chew". If you want to use all purpose only, you can but the flat breads will be softer. Ok, who is going to make these and bring them to me to eat? Looks a bit too much for me to make. Oh yes..........this must be made. Mandy - love your photos!!!!!!!!!!!!!!!! And love your explanations. You rock!!! !